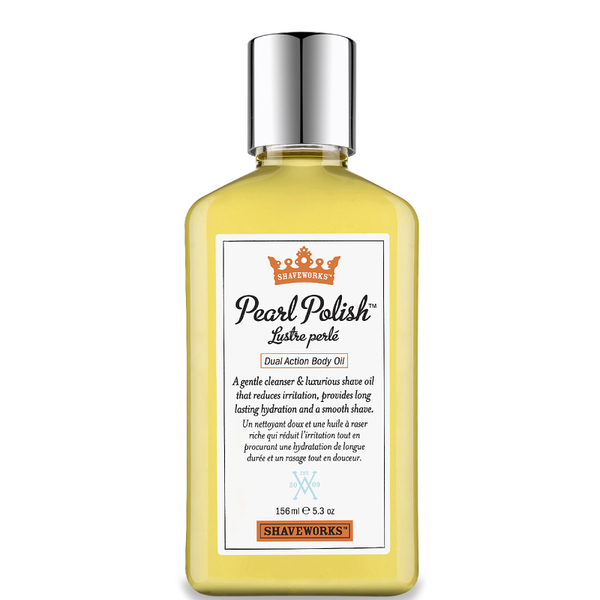 Pearl Polish Dual Action Body Oil from Shaveworks. 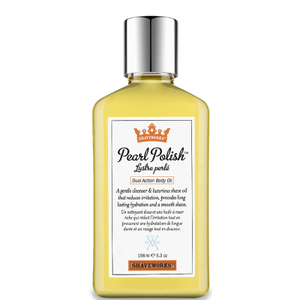 Its gentle, yet powerful formula transforms into a milky foam when mixed with water to remove dirt and grime and leave behind a refreshing fragrance of ginger, lavender and vanilla. The versatile oil can be used as pre-shave oil to allow effortless gliding of the razor for a smoother, closer shave. Experience conditioned and hydrated skin with a silky-soft touch. E.N. Use every day as a luxurious body cleanser - simply mix with water and watch it transform into a smooth, milky foam that cleans and softens skin. Use the oil while shaving - massage a small amount onto legs, private areas or underarms during or after a shower. Rinse razor after every other stroke for the smoothest shave. Rinse with warm water.